I had forgotten that this was the 20th anniversary of the start of the Euro. But the Eurocrats in Brussels hadn't. Some hours before the New Year commenced, Juncker and friends put out a press release extoling the virtues of the Euro. Virtues such as "unity, sovereignty, and stability … prosperity". Well so much for New Year cheer. With this one tweet, the EU put 2019 on track to be even worse than 2018. Using any of those words to describe the Euro—apart perhaps from "unity", since the same currency is used across most of continental Europe now—is a travesty of fact that even Donald Trump might baulk at. Sovereignty? Tell that to the Greeks, Italians or French, who have had their national economic policies overridden by Brussels. Stability? Economic growth has been far more unstable under the Euro than before it, and Europe today is riven with political instability which can be directly traced to the straitjacket the Euro and the Maastricht Treaty imposed. Prosperity? Let's bring some facts into Juncker's fact-free guff. I'll start with Phil's point about Greece. Greece's GDP has fallen at Great Depression rates since the Eurozone imposed its austerity policies on it, and nominal GDP today is more than 25% below its peak. Now of course that could be blamed on the Greeks themselves, so let's look compare economic growth in the entire Eurozone to the USA (minus Ireland and Luxembourg, since in the former case their data is massively distorted by data revisions, and the latter has highly volatile data as well, and is so small—under 600,000 people—that it can safely be ignored). 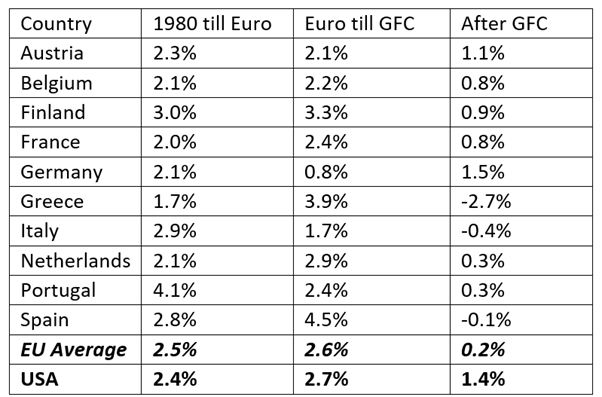 Before the Euro, economic growth averaged 2.5% per year, versus 2.4% in the USA. After the Euro but before the Global Financial Crisis, growth in the Eurozone averaged 2.6%--a 0.1% improvement over pre-Euro levels; but the USA's growth rate rose to 2.7%, so in comparative terms, the Eurozone fell compared to the USA. So Europe's tiny improvement over it's pre-Euro growth rate may be due to factors other than the Euro itself, and its improvement was substantially smaller than the USA's. 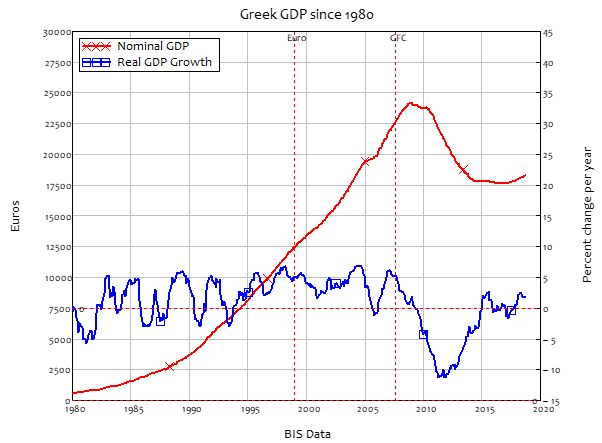 But the real comparison is with growth since the crisis. The USA's average post-crisis growth rate has been anaemic at 1.4%, but this is positively dynamic in comparison to the entire Eurozone's average post-crisis growth rate of 0.2%. 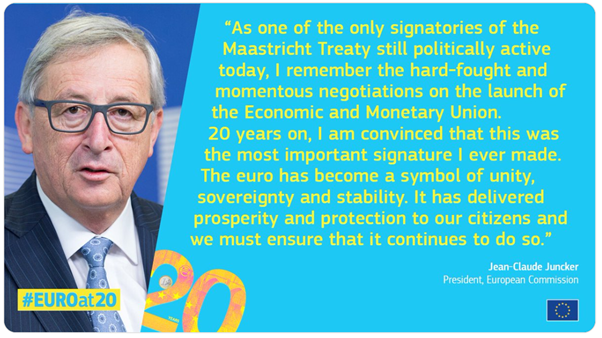 Europe has basically been stagnant for a decade, thanks to the Euro and the austerity policies that are inseparable from it, courtesy of the Maastricht Treaty that Juncker is so proud to have signed. In reality, the Euro has brought low growth, economic instability, and political discord to Europe. Yet Europe's unaccountable leaders spin it as an unbridled positive, at a time when ordinary citizens of Europe are donning Yellow Vests and bemoaning their plight. If this coordinated spin from the Eurozone's bosses—I refuse to call them "leaders", because that implies they can be removed—is the best they can do, then 2019 will be every bit as politically unstable as 2018.